Perseus’ meeting with Hermes had bolstered up his spirits, and he came to the mountain where the three Graeae lived feeling confident. The air was scalding hot and a cloud of dust rose at each step he took. The closer he approached, the more the landscape turned grey. The rays of the sun did not reach into this sinister region. The journey was long and painful. Yet each time he hesitated about which path to follow, Hermes would point him in the right direction. When he arrived at the cave of the three old women, he hid himself not too far from the entrance and waited. Soon he saw them appear. One could just barely make out their forms in the flickering light of a candle that one of them was carrying. They were horrible to look at. Their skin was yellow and wrinkled, like old crumpled paper. Their white hair fell in disarray over their shoulders, like skeins of string. And a foul smell exuded from their bodies, a smell of withered flowers and mustiness which stung one’s throat. “It is my turn to look! Pass me the eye!” said one of them in a harsh, metallic voice. “No! It’s my turn!” replied the other old woman, in an equally rasping tone. “I am hungry, so give me the tooth!” cried the third sister. Perseus then saw the one who had spoken first take out her solitary tooth and hand it to her sister. In the meantime, the second removed her solitary eye and passed it to the third sister. The three sisters shared a single eye and a single tooth among them. Perseus observed the three old women playing this game of pass the parcel; then he did as Hermes advised. As one of them was removing her eye to give it to one of the other two, he leapt forward and snatched the eye. The three Graeae could no longer see a thing! They began to shout and argue among themselves to find out which had taken the eye, but Perseus interrupted them and said in a strong voice: “It is I, Perseus, who holds your eye. If you wish me to give it back to you, show me the way that will lead me to your sisters the Gorgons.” After a moment of bewilderment, the Graeae gave him all the directions he needed to reach the den where their horrible sisters were hiding. Perseus hesitated as to whether he ought to give them back the eye. Yet he had promised and he had to keep his word. He returned the eye to them and departed immediately. Hermes had left him a little earlier and Perseus was now travelling alone. He heard a little laughter. Then a woman appeared on his path. She bore a helmet and a spear and she stood proudly erect in her armour. Perseus recognized immediately the goddess Athena. Perseus took Athena’s shield. It shone like the sun. When he lifted up his dazzled head to thank the goddess, she had already vanished. Perseus was walking sure-footed towards the den of the three monsters, but Hermes did not feel so easy in his mind. That’s why he had gone away: to seek help. Soon enough, he rejoined Perseus along the way, carrying a huge sack on his shoulder. This time, Perseus was properly armed to wage battle against the Gorgons. Happy as a child in front of new toys, he put on the winged sandals, drew the long sword out of its scabbard, grabbed hold of Athena’s shield and put on the helmet of Hades. He instantly became invisible and flew away towards the Gorgons’ den. “Do not forget,” Hermes cried after him, “you can only kill Medusa. She is the only one of the three Gorgons who can die, the other two are immortal, do not attack them!” Perseus, however, was already far away. Hermes’ words were lost in the wind. The messenger god decided to follow the young man in order to keep an eye on him. The Gorgons lived on an icy island battered by raging winds. Perseus flew first of all across the ocean, until he noticed an island with beautiful cold and deserted beaches. There he discovered an absolutely incredible landscape and he knew that he was approaching the Gorgons’ lair. There were animals of every kind and some men as well. But as he approached, he realized that these were statues of stone. Each had met the gaze of one of the Gorgons and had been immediately transformed into a statue! Perseus landed and began to walk amidst the statues of stone. He was touched by the fate of all these wretched creatures and his anger rose up inside him. When he reached the cave where the Gorgons lived, they were all three asleep. Perseus observed them on Athena’s shield, which served him as a mirror. They were even more appalling than anything Perseus had been able to imagine. Their heads were aswarm with snakes writhing in every direction and their necks were covered with dragon scales. They had enormous golden wings and their hands bore talons of bronze. He flew above the sleeping Gorgons, yet his hand was reluctant to strike. If he missed his target, what would happen once the monstrous sisters were awake? And, what is more, which of the three was Medusa? Hermes again came to his aid. He indicated Medusa to him with a motion of his hand. 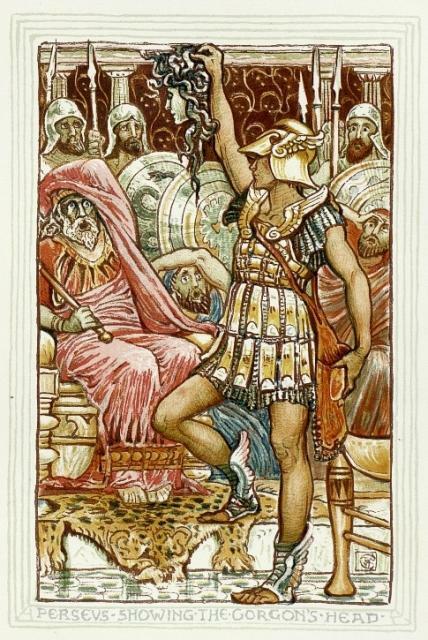 Perseus then brandished his heavy sword while keeping a keen eye on Medusa on the mirror-shield. And Athena, who was also watching discreetly from the heights of Olympus, guided his hand. His magic sword came crashing down and lopped off Medusa’s head with one clean blow. He came down immediately, grabbed the head, catching hold of it by its vile snake-hair, and slipped it inside his sack without looking at it. He had thus escaped the terrible gaze which turned people into stone. Instantly, an incredible winged horse emerged from Medusa’s body, by the name of Pegasus. For a moment Perseus stood there dazzled, his breath taken away by the winged horse’s beauty. He stretched out his hand towards the animal to catch it, but the horse immediately flew away towards Olympus and disappeared from Perseus’ sight. In the meantime, the other two Gorgons had woken up and were getting ready to go after Medusa’s murderer. Would Perseus manage to escape his pursuers? Extracted from The Adventures of Hermes, God of Thieves: 100 Journeys through Greek Mythology, translated by Mika Provata-Carlone. Murielle Szac was born in Lyon. She has worked as a political journalist, editor-in-chief at various children’s magazines and directed a number of documentaries for television. 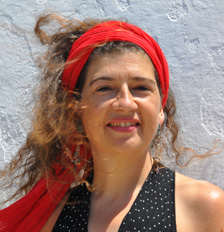 She has also written several books for children, including The Adventures of Theseus, as well as The Adventures of Hermes, and is currently the publisher of a children’s imprint at Actes Sud Junior. 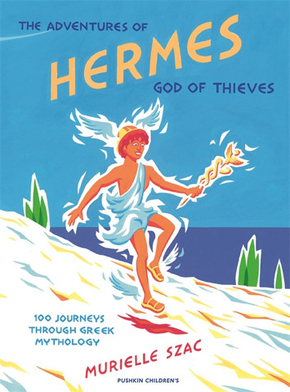 The Adventures of Hermes is published by Pushkin Children’s Books. Read more.